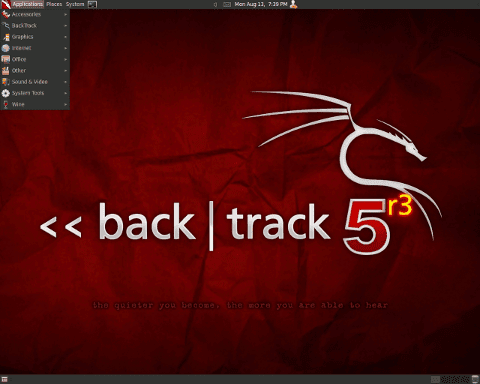 BackTrack is an Ubuntu-based distribution with a collection of security and forensics tools. It was created by merging Auditor Security Linux with WHAX (formerly Whoppix).. The BackTrack Development team will be releasing an R3 revision of our Penetration Testing distribution in 2 weeks. This release focuses on bugfixes and over 50 new tool additions ΓÇô making it the most potent revision yet. We have released a BT5 R3 preview in BlackHat Vegas for the enjoyment of conference attendees, which can be found in their delegate bags. The DVD contains a BT5 R3 Gnome, 32 bit edition ΓÇô burnt as an ISO (as opposed to an image). We will be taking in our last bug reports and tool suggestions from the BH / Defcon crowds for our upcoming official release, which will be on August 13th, 2012. Current BT5 users can simply upgrade to the latest release using the regular update commands. More details will be released along with the full listing of new tools on the 13th of August. We hope you enjoy this fine release as much as we do! Thanks To RRN Information Security Team.